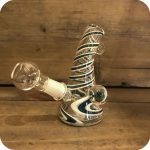 This Small Colorful Beaker Water Pipe is a perfectly simple and elegant pipe. It could be a great starter water pipe for a new smoker. It stands at about seven and a half inches tall and features a very sturdy flat base. To use, simply fill the water pipe with water to your desired level. Then, pack the bowl with your favorite legal herbs or smoking tobacco. Light the bowl as you start to slowly inhale. Watch the smoke build up, and when it’s time to clear the smoke pull the bowl from the pipe and inhale one last time. It is as easy as that. Keep this pipe cleaned and maintained regularly and it could last your a lifetime! Smokers all over the world recommend Formula 420 for keeping their glassware cleaned. 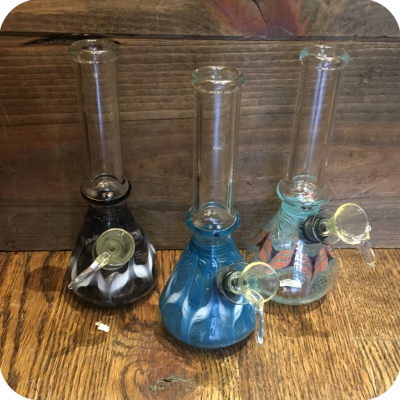 Tags: Beaker Water Pipe, Brooklyn, brooklyn smoke shop, bushwick head shop, Colorful Beaker, Small Colorful Beaker Water Pipes, water pipe.